Being overwhelmed is one of the top obstacles standing in the way of actually reaching your goals. You feel like you have no idea where to begin when odds are, you do have a pretty good idea, it’s just clouded by the overwhelm. 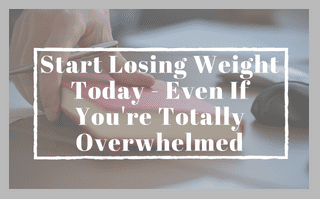 This article will show you exactly how to get started today, even if you’ve been feeling totally overwhelmed. One large contributor to overwhelm is feeling like you have to make a drastic overhaul all at once in order to see any results. That’s just not true and it’s likely part of why you haven’t taken any action, yet. Instead of waiting until the “perfect” time (hint: there won’t be one), start with whatever small changes feel manageable at this very moment. You might be thinking that these things are so insignificant that they won’t make any difference. But that’s just not the case. Your results will come as the result of small, repeated efforts, day-after-day. If you’re currently not doing anything because you feel like you can’t make a big enough effort, the result is you’re doing nothing, right? So isn’t just a little bit of improvement better than nothing? Once you’ve picked one or a few of the ideas above, the next step is to do them consistently, until they hardly feel like an effort at all. This might happen pretty quickly, especially if you’re returning to a habit that you used to do regularly. Or it might take a few weeks to start to feel normal. It doesn’t matter how long it takes, just that you keep making the effort. Personally, I am a big fan of task charts to give me an incentive to do what I say I want to do. If you think that might work for you, feel free to steal this template. The top priority here is being consistent so keep taking those actions, no matter how foolishly small or inconsequential they might feel. If they’re that small, it’s really no big deal to keep doing them, right? Now that your initial undertakings are feeling like second nature, it’s time to add a few more small actions. You can pick from the list above or add some of your own that you’ve thought of since you got started. Maybe you’ve consistently been having veggies at 1 meal per day for the last couple weeks and now you want to step it up a bit and have them at 2-3 meals each day. Or maybe you decided to tackle veggies and you’re feeling great about your intake so now it’s time to shift focus to increasing your protein intake. Unrealistic expectations are one of the primary reasons that people give up. It’s important to recognize that the results you get are correlated with the effort you put in. As you’re able to take on more, or more drastic, changes, larger, more drastic results will follow. Want someone to brainstorm with about exactly what actions to take to start getting some wins under your belt? Feel like you’re ready for a more drastic overhaul but want to make sure you’re going about it the right way?